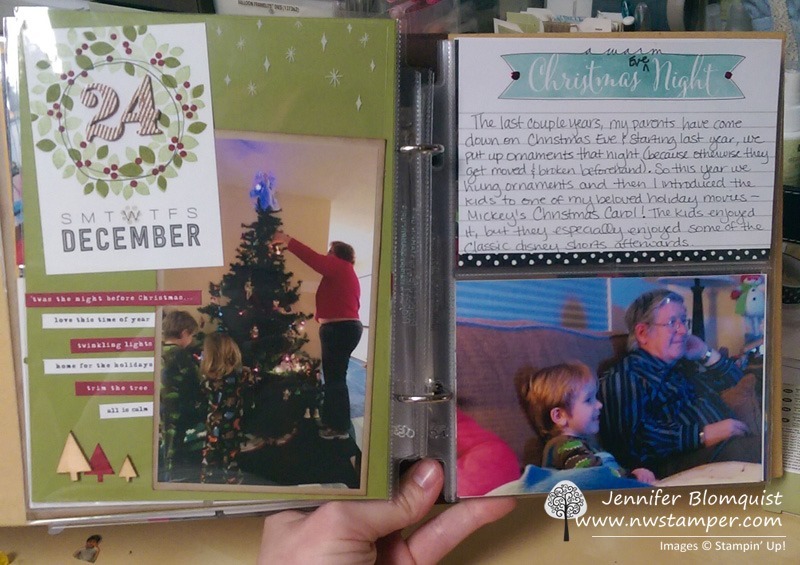 Ok, my brain is on Project Life and pocket page scrapbooking because I’m so stinkin’ excited for having finished up my complete December Daily album for 2014. Yes! You heard me right… I actually finished a scrapbook LESS THAN A MONTH after the photos were taken!! What?! I know, how crazy is that. But it made me realize how super quick and easy getting your photos off of your computer and into a book can be. Especially thanks to the accessory kits that Stampin’ Up has created to go along with the card kits. Seriously, I can make my pages cute and not have to think very much because I just dump out all the supplies on my craft table and just pick from the pile for each page. But what if you have extra cards or you don’t feel making a scrapbook album? How about a card! Pick a bold patterned 4×6 card (like this black and white patterned one from the Everyday Adventure card kit) and trim it down to a smaller size for your background paper. This was cut down to 4”x5.25”. 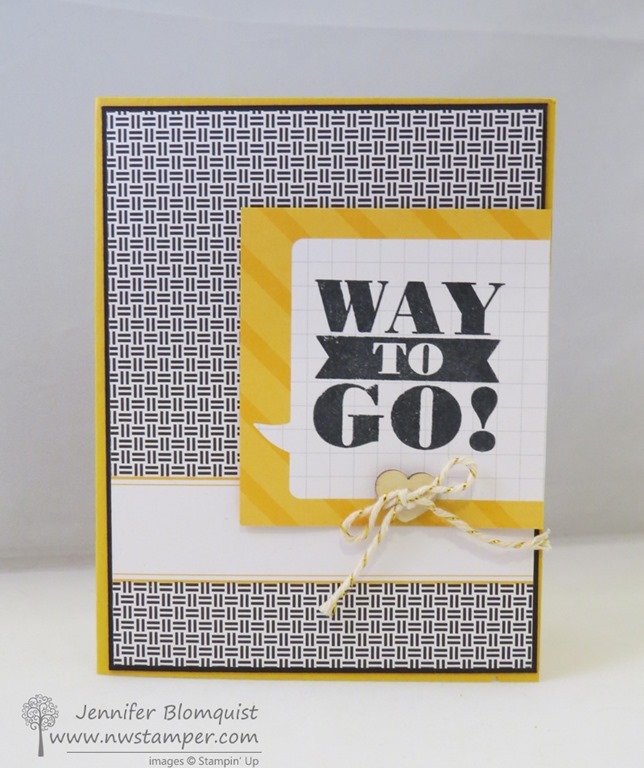 Mat the card with a slightly larger cardstock piece (like this 4-1/8” x 5-3/8” piece of Basic Black) for a big impact. Take a 3”x4” journaling card and don’t be afraid to turn it on it’s side or cut it down for your sentiment! 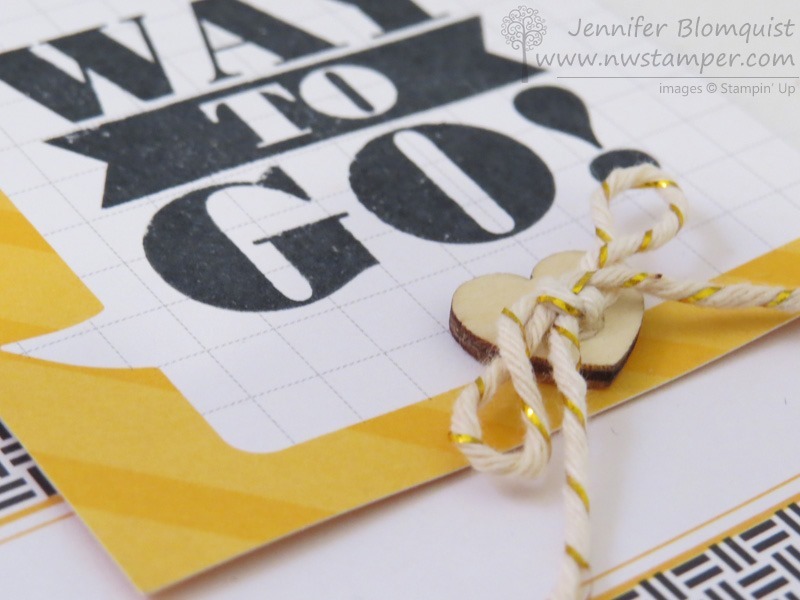 Then stamp away – like with this sentiment from the Bravo stamp set. Add a simple accent with glue dots – like the Wooden Elements heart and then a bow out of the Gold Baker’s Twine and you are done! Or go check out all the options for Project Life cards and accessory kits (seriously, from now on I’m always getting the accessory kit when I buy a card kit!). You can even get a special Project Life card kit for FREE as a choice during Sale-a-Bration with a $50 order. Sweet, right? !